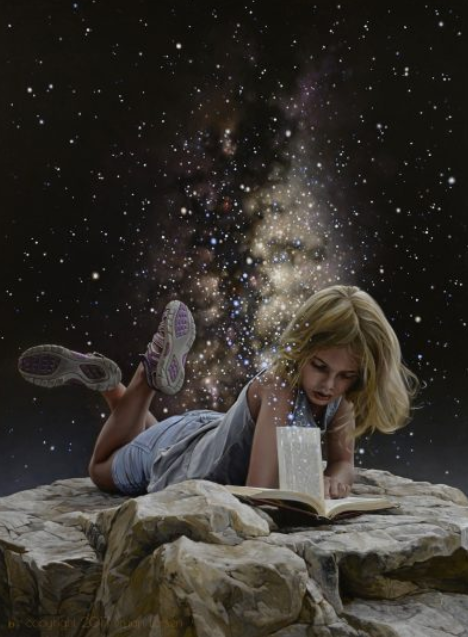 A young woman casually reads her novel by the light of nearby Earth and Luna. Get 10% off the total purchase price if you add "Reading By Moonlight II" to your order. Details: This is for a fine art giclee on canvas AND paper reproduction of the original painting. The canvas reproduction captures the original raised texture of the canvas, while the acid-free fine art paper has a smooth matte finish and a natural-white color, with excellent longevity. 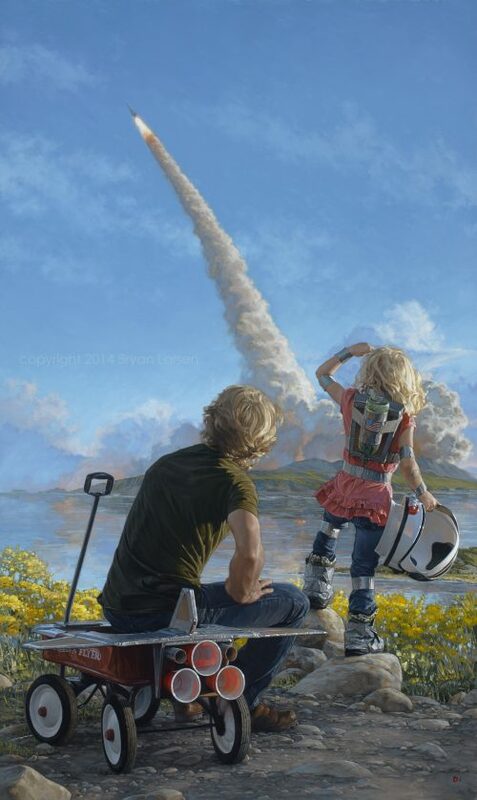 Both the canvas and paper giclees feature only archival inks and are limited edition runs of 95. Process: Each giclee and print is carefully reviewed by Bryan for quality assurance. He will then sign each one, and number the giclee if it is part of a limited edition. The giclee is then wrapped with glassine/non-stick paper and taped closed for shipping. Each limited edition print comes with a Certificate of Authenticity that includes information about its creation, its edition number, and an embossed seal. The package will also include shipping and return information. Hover cursor over image to zoom in. Shipping: PRINTED TO ORDER. Please allow two weeks for printing and packaging of your piece. Some print runs may have stock pre-printed, in which case the piece will ship sooner. Shipments of giclees will be provided in thick rigid mailing tubes for protection during shipping. Framing: The framing stage is an important one! The frame you choose should reflect your taste and contain design elements (texture, color, decorating style) of the room in which it will be hung. Bryan recommends that you shop at your local framers for a style and price that you like, then take your artwork in for a consultation. Most framers have lots of experience and can help you pick out the perfect frame for your piece. Canvas giclees should be wrapped around stretcher bars or mounted to a solid surface. Some framers can also provide what's called a "gallery wrap" where the print is wrapped with the edges exposed. These should not be placed under glass. Paper giclees should be placed under glass and can also be matted. Certificate of Authenticity: The Certificate of Authenticity is a document provided with each painting, limited edition giclee, or print that certifies that it is an authentic reproduction by the artist. It also provides additional information about the painting or giclee/print, such as the specifics of the original (e.g., size, medium, and dimensions), as well as details about the reproduction, such as edition number, etc. Each Certificate is signed and embossed by the artist. Please retain your Certificate as an added store of value and as a collector's proof of purchase. More questions? Please see this helpful FAQ. 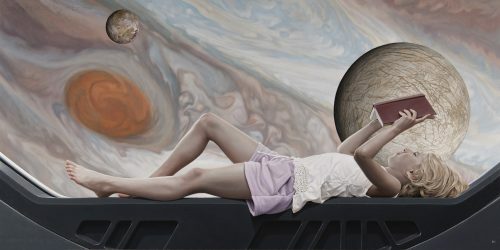 A young woman casually reads her novel by the light of a nearby Jupiter and Jovian moon. Get 10% off the total purchase price if you add "Reading By Moonlight I" to your order. Details: This is for a fine art giclee on canvas AND paper reproduction of the original painting. The canvas reproduction captures the original raised texture of the canvas, while the acid-free fine art paper has a smooth matte finish and a natural-white color, with excellent longevity. Both the paper and canvas print runs feature only archival inks and both are limited edition runs of 95. Process: Each giclee and print is carefully reviewed by Bryan for quality assurance. He will then sign each one, and number the giclee if it is part of a limited edition. The giclee is then wrapped with glassine/non-stick paper and taped closed for shipping. Each limited edition print comes with a Certificate of Authenticity that includes information about its creation, its edition number, and an embossed seal. The package will also include shipping and return information. Hover cursor over image to zoom in. Shipping: PRINTED TO ORDER. Please allow two weeks for printing and packaging of your piece. Some print runs may have stock pre-printed, in which case the piece will ship sooner. Shipments of giclees will be provided in thick rigid mailing tubes for protection during shipping. Framing: The framing stage is an important one! The frame you choose should reflect your taste and contain design elements (texture, color, decorating style) of the room in which it will be hung. Bryan recommends that you shop at your local framers for a style and price that you like, then take your artwork in for a consultation. Most framers have lots of experience and can help you pick out the perfect frame for your piece. Canvas giclees should be wrapped around stretcher bars or mounted to a solid surface. Some framers can also provide what's called a "gallery wrap" where the print is wrapped with the edges exposed. These should not be placed under glass. Paper giclees should be placed under glass and can also be matted. Certificate of Authenticity: The Certificate of Authenticity is a document provided with each painting, limited edition giclee, or print that certifies that it is an authentic reproduction by the artist. 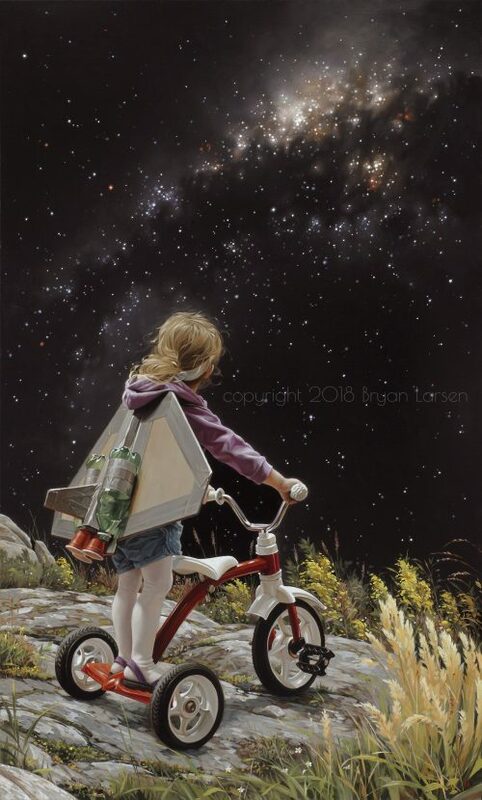 It also provides additional information about the painting or giclee/print, such as the specifics of the original (e.g., size, medium, and dimensions), as well as details about the reproduction, such as edition number, etc. Each Certificate is signed and embossed by the artist. Please retain your Certificate as an added store of value and as a collector's proof of purchase. More questions? Please see this helpful FAQ. 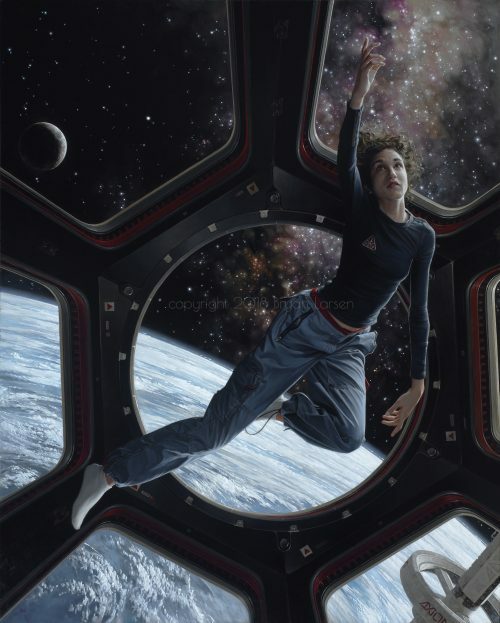 An updated take on How Far We've Come, this painting alludes to the challenge of living in space, and how humanity can and must thrive in new environments. Details: This is for a fine art giclee on canvas reproduction of the original painting. The reproduction captures the original raised texture of the canvas. This print run features only archival inks on fine art canvas with a nice raised texture and a limited edition run of 95. Process: Each giclee and print is carefully reviewed by Bryan for quality assurance. He will then sign each one, and number the giclee if it is part of a limited edition. The giclee is then wrapped with glassine/non-stick paper and taped closed for shipping. Each limited edition print comes with a Certificate of Authenticity that includes information about its creation, its edition number, and an embossed seal. The package will also include shipping and return information. Hover cursor over image to zoom in. Shipping: PRINTED TO ORDER. Please allow two weeks for printing and packaging of your piece. Some print runs may have stock pre-printed, in which case the piece will ship sooner. Shipments of giclees will be provided in thick rigid mailing tubes for protection during shipping. Framing: The framing stage is an important one! The frame you choose should reflect your taste and contain design elements (texture, color, decorating style) of the room in which it will be hung. Bryan recommends that you shop at your local framers for a style and price that you like, then take your artwork in for a consultation. Most framers have lots of experience and can help you pick out the perfect frame for your piece. Canvas giclees should be wrapped around stretcher bars or mounted to a solid surface. Some framers can also provide what's called a "gallery wrap" where the print is wrapped with the edges exposed. These should not be placed under glass. Certificate of Authenticity: The Certificate of Authenticity is a document provided with each painting, limited edition giclee, or print that certifies that it is an authentic reproduction by the artist. It also provides additional information about the painting or giclee/print, such as the specifics of the original (e.g., size, medium, and dimensions), as well as details about the reproduction, such as edition number, etc. Each Certificate is signed and embossed by the artist. Please retain your Certificate as an added store of value and as a collector's proof of purchase. More questions? Please see this helpful FAQ. 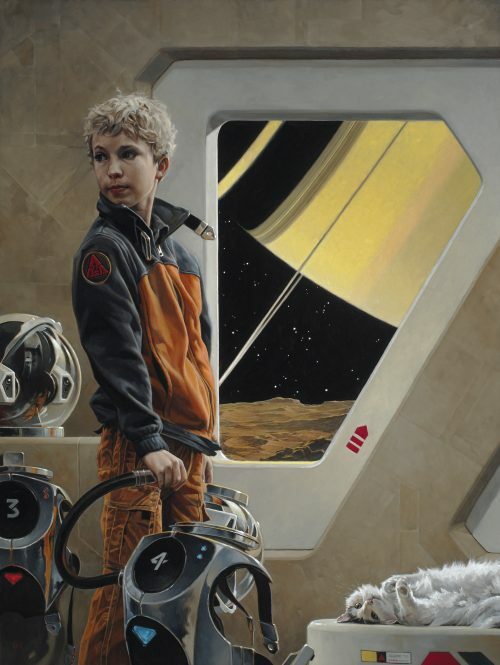 A young future astronaut contemplates the road to unknown adventure and discovery ... IN SPAAAACCCEE! Details: This is for a fine art giclee on canvas reproduction of the original painting. The reproduction captures the original raised texture of the canvas. This print run features only archival inks on fine art canvas with a nice raised texture and a limited edition run of 95. 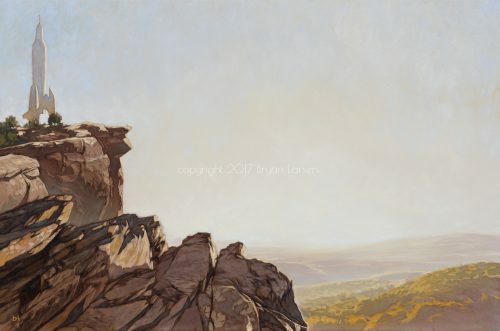 Process: Each giclee and print is carefully reviewed by Bryan for quality assurance. He will then sign each one, and number the giclee if it is part of a limited edition. The giclee is then wrapped with glassine/non-stick paper and taped closed for shipping. Each limited edition print comes with a Certificate of Authenticity that includes information about its creation, its edition number, and an embossed seal. The package will also include shipping and return information. Hover cursor over image to zoom in. Shipping: PRINTED TO ORDER. Please allow two weeks for printing and packaging of your piece. Some print runs may have stock pre-printed, in which case the piece will ship sooner. Shipments of giclees will be provided in thick rigid mailing tubes for protection during shipping. Framing: The framing stage is an important one! The frame you choose should reflect your taste and contain design elements (texture, color, decorating style) of the room in which it will be hung. Bryan recommends that you shop at your local framers for a style and price that you like, then take your artwork in for a consultation. Most framers have lots of experience and can help you pick out the perfect frame for your piece. Canvas giclees should be wrapped around stretcher bars or mounted to a solid surface. Some framers can also provide what's called a "gallery wrap" where the print is wrapped with the edges exposed. These should not be placed under glass. Certificate of Authenticity: The Certificate of Authenticity is a document provided with each painting, limited edition giclee, or print that certifies that it is an authentic reproduction by the artist. It also provides additional information about the painting or giclee/print, such as the specifics of the original (e.g., size, medium, and dimensions), as well as details about the reproduction, such as edition number, etc. Each Certificate is signed and embossed by the artist. Please retain your Certificate as an added store of value and as a collector's proof of purchase. More questions? Please see this helpful FAQ. A young lady explores new worlds without ever leaving the comforts of a well-written tome. Details: This is for a fine art giclee on canvas reproduction of the original painting. The reproduction captures the original raised texture of the canvas. This print run features only archival inks on fine art canvas with a nice raised texture and a print run of 95. Process: Each giclee and print is carefully reviewed by Bryan for quality assurance. He will then sign each one, and number the giclee if it is part of a limited edition. The giclee is then wrapped with glassine/non-stick paper and taped closed for shipping. Each limited edition print comes with a Certificate of Authenticity that includes information about its creation, its edition number, and an embossed seal. The package will also include shipping and return information. Hover cursor over image to zoom in. Shipping: PRINTED TO ORDER. Please allow two weeks for printing and packaging of your piece. Some print runs may have stock pre-printed, in which case the piece will ship sooner. Shipments of giclees will be provided in thick rigid mailing tubes for protection during shipping. Framing: The framing stage is an important one! The frame you choose should reflect your taste and contain design elements (texture, color, decorating style) of the room in which it will be hung. Bryan recommends that you shop at your local framers for a style and price that you like, then take your artwork in for a consultation. Most framers have lots of experience and can help you pick out the perfect frame for your piece. Canvas giclees should be wrapped around stretcher bars or mounted to a solid surface. Some framers can also provide what's called a "gallery wrap" where the print is wrapped with the edges exposed. These should not be placed under glass. Certificate of Authenticity: The Certificate of Authenticity is a document provided with each painting, limited edition giclee, or print that certifies that it is an authentic reproduction by the artist. It also provides additional information about the painting or giclee/print, such as the specifics of the original (e.g., size, medium, and dimensions), as well as details about the reproduction, such as edition number, etc. Each Certificate is signed and embossed by the artist. Please retain your Certificate as an added store of value and as a collector's proof of purchase. More questions? Please see this helpful FAQ. Details: This is for a fine art giclee on canvas reproduction of the original painting. The reproduction captures the original raised texture of the canvas. This print run features only archival inks on fine art canvas with a nice raised texture and a limited edition run of 95. Process: Each giclee and print is carefully reviewed by Bryan for quality assurance. He will then sign each one, and number the giclee if it is part of a limited edition. The giclee is then wrapped with glassine/non-stick paper and taped closed for shipping. Each limited edition print comes with a Certificate of Authenticity that includes information about its creation, its edition number, and an embossed seal. The package will also include shipping and return information. Hover cursor over image to zoom in. Shipping: PRINTED TO ORDER. Please allow two weeks for printing and packaging of your piece. Some print runs may have stock pre-printed, in which case the piece will ship sooner. Shipments of giclees will be provided in thick rigid mailing tubes for protection during shipping. Framing: The framing stage is an important one! The frame you choose should reflect your taste and contain design elements (texture, color, decorating style) of the room in which it will be hung. Bryan recommends that you shop at your local framers for a style and price that you like, then take your artwork in for a consultation. Most framers have lots of experience and can help you pick out the perfect frame for your piece. Canvas giclees should be wrapped around stretcher bars or mounted to a solid surface. Some framers can also provide what's called a "gallery wrap" where the print is wrapped with the edges exposed. These should not be placed under glass. Certificate of Authenticity: The Certificate of Authenticity is a document provided with each painting, limited edition giclee, or print that certifies that it is an authentic reproduction by the artist. It also provides additional information about the painting or giclee/print, such as the specifics of the original (e.g., size, medium, and dimensions), as well as details about the reproduction, such as edition number, etc. Each Certificate is signed and embossed by the artist. Please retain your Certificate as an added store of value and as a collector's proof of purchase. More questions? Please see this helpful FAQ. 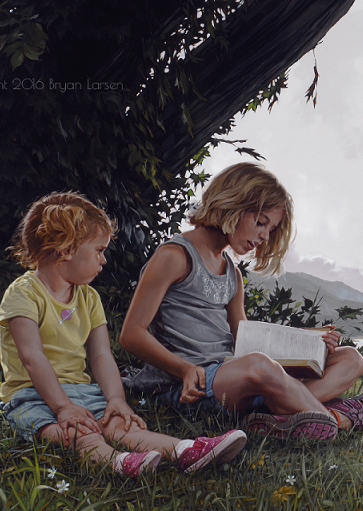 The original painting of "Anticipation" was completed in 2016. It is 12 x 16 inches, with oil on aluminum composite construction. 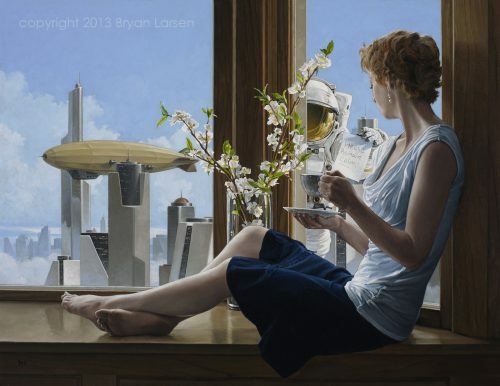 The "Anticipation" giclee is also 12 x 16 inches, on canvas with archival inks. Details: This is for a fine art giclee on canvas reproduction of the original painting. The reproduction captures the original raised texture of the canvas. This print run features only archival inks on fine art canvas with a nice raised texture and a limited edition run of 95. Process: Each giclee and print is carefully reviewed by Bryan for quality assurance. He will then sign each one, and number the giclee if it is part of a limited edition. The giclee is then wrapped with glassine/non-stick paper and taped closed for shipping. Each limited edition print comes with a Certificate of Authenticity that includes information about its creation, its edition number, and an embossed seal. The package will also include shipping and return information. Hover cursor over image to zoom in. Shipping: PRINTED TO ORDER. Please allow two weeks for printing and packaging of your piece. Some print runs may have stock pre-printed, in which case the piece will ship sooner. Shipments of giclees will be provided in thick rigid mailing tubes for protection during shipping. Framing: The framing stage is an important one! The frame you choose should reflect your taste and contain design elements (texture, color, decorating style) of the room in which it will be hung. Bryan recommends that you shop at your local framers for a style and price that you like, then take your artwork in for a consultation. Most framers have lots of experience and can help you pick out the perfect frame for your piece. Canvas giclees should be wrapped around stretcher bars or mounted to a solid surface. Some framers can also provide what's called a "gallery wrap" where the print is wrapped with the edges exposed. These should not be placed under glass. Certificate of Authenticity: The Certificate of Authenticity is a document provided with each painting, limited edition giclee, or print that certifies that it is an authentic reproduction by the artist. 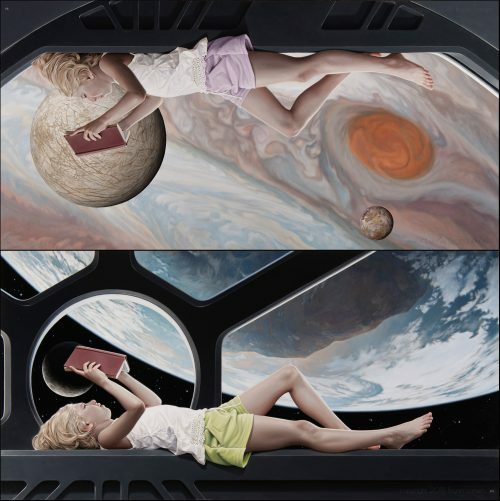 It also provides additional information about the painting or giclee/print, such as the specifics of the original (e.g., size, medium, and dimensions), as well as details about the reproduction, such as edition number, etc. Each Certificate is signed and embossed by the artist. Please retain your Certificate as an added store of value and as a collector's proof of purchase. More questions? Please see this helpful FAQ. With his beautiful, massive wings outstretched, Icarus lands, while Daedalus' grief is transfigured to elation and surprise, and ultimately triumph. Details: This is for a fine art giclee on canvas reproduction of the original painting. The reproduction captures the original raised texture of the canvas. This print run features only archival inks on fine art canvas with a nice raised texture. The run for the largest size print is 10, medium size is 45, and the smallest size is 75. Process: Each giclee and print is carefully reviewed by Bryan for quality assurance. He will then sign each one, and number the giclee if it is part of a limited edition. The giclee is then wrapped with glassine/non-stick paper and taped closed for shipping. Each limited edition print comes with a Certificate of Authenticity that includes information about its creation, its edition number, and an embossed seal. The package will also include shipping and return information. Hover cursor over image to zoom in. Shipping: PRINTED TO ORDER. Please allow two weeks for printing and packaging of your piece. Some print runs may have stock pre-printed, in which case the piece will ship sooner. Shipments of giclees will be provided in thick rigid mailing tubes for protection during shipping. Framing: The framing stage is an important one! The frame you choose should reflect your taste and contain design elements (texture, color, decorating style) of the room in which it will be hung. Bryan recommends that you shop at your local framers for a style and price that you like, then take your artwork in for a consultation. Most framers have lots of experience and can help you pick out the perfect frame for your piece. Canvas giclees should be wrapped around stretcher bars or mounted to a solid surface. Some framers can also provide what's called a "gallery wrap" where the print is wrapped with the edges exposed. These should not be placed under glass. Certificate of Authenticity: The Certificate of Authenticity is a document provided with each painting, limited edition giclee, or print that certifies that it is an authentic reproduction by the artist. It also provides additional information about the painting or giclee/print, such as the specifics of the original (e.g., size, medium, and dimensions), as well as details about the reproduction, such as edition number, etc. Each Certificate is signed and embossed by the artist. Please retain your Certificate as an added store of value and as a collector's proof of purchase. More questions? Please see this helpful FAQ. 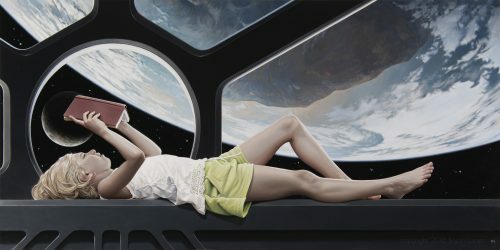 Based on the painting "Taking Time", this painting started as a joke on Facebook and ended up being crowd-funded through pre-sale of prints. It was a fantastic and very fun experiment. I'm hoping to do similar crowd-funded paintings in the coming year. 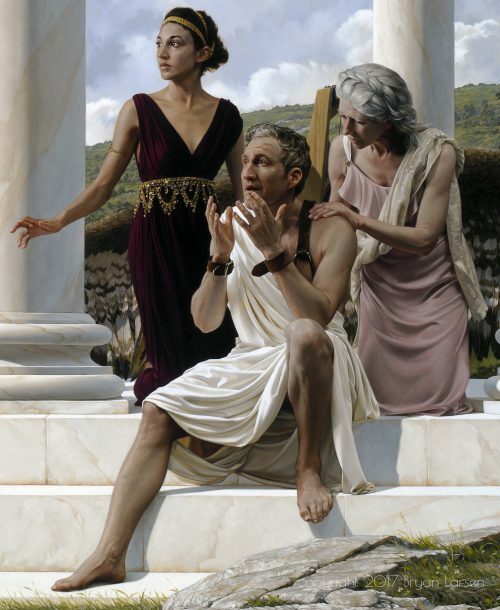 This one was completed in 2013 and measured 30 x 24 inches, oil on linen. The "Please Remain Calm" giclee is a little bit smaller than the original, at 16 x 20 inches of canvas. Details: This is for a fine art giclee on canvas reproduction of the original painting. The reproduction captures the original raised texture of the canvas. This print run features only archival inks on fine art canvas with a nice raised texture and a limited edition run of 95. Process: Each giclee and print is carefully reviewed by Bryan for quality assurance. He will then sign each one, and number the giclee if it is part of a limited edition. 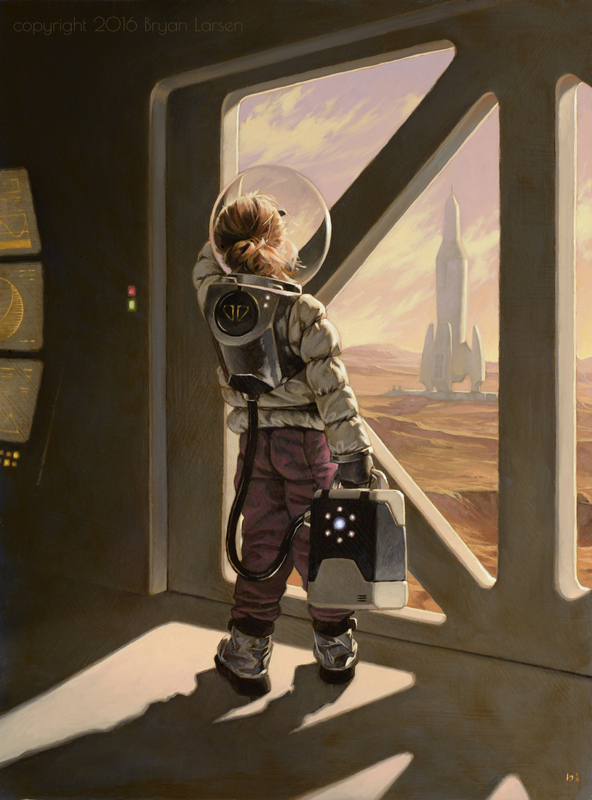 The giclee is then wrapped with glassine/non-stick paper and taped closed for shipping. Each limited edition print comes with a Certificate of Authenticity that includes information about its creation, its edition number, and an embossed seal. The package will also include shipping and return information. Hover cursor over image to zoom in. Shipping: PRINTED TO ORDER. Please allow two weeks for printing and packaging of your piece. Some print runs may have stock pre-printed, in which case the piece will ship sooner. Shipments of giclees will be provided in thick rigid mailing tubes for protection during shipping. Framing: The framing stage is an important one! The frame you choose should reflect your taste and contain design elements (texture, color, decorating style) of the room in which it will be hung. Bryan recommends that you shop at your local framers for a style and price that you like, then take your artwork in for a consultation. Most framers have lots of experience and can help you pick out the perfect frame for your piece. Canvas giclees should be wrapped around stretcher bars or mounted to a solid surface. Some framers can also provide what's called a "gallery wrap" where the print is wrapped with the edges exposed. These should not be placed under glass. 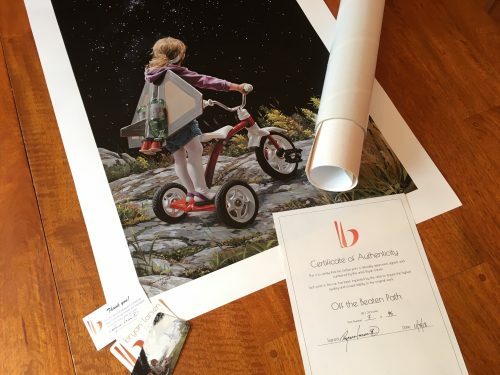 Certificate of Authenticity: The Certificate of Authenticity is a document provided with each painting, limited edition giclee, or print that certifies that it is an authentic reproduction by the artist. It also provides additional information about the painting or giclee/print, such as the specifics of the original (e.g., size, medium, and dimensions), as well as details about the reproduction, such as edition number, etc. Each Certificate is signed and embossed by the artist. Please retain your Certificate as an added store of value and as a collector's proof of purchase. More questions? Please see this helpful FAQ. 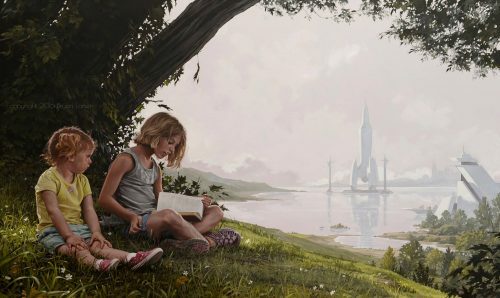 Two young ladies take a reading break on a scenic vista, with modern "amenities" in harmony with their surroundings. Details: This is for a fine art giclee on canvas reproduction of the original painting. The reproduction captures the original raised texture of the canvas. This print run features only archival inks on fine art canvas with a nice raised texture and a limited edition run of 95. Process: Each giclee and print is carefully reviewed by Bryan for quality assurance. He will then sign each one, and number the giclee if it is part of a limited edition. The giclee is then wrapped with glassine/non-stick paper and taped closed for shipping. Each limited edition print comes with a Certificate of Authenticity that includes information about its creation, its edition number, and an embossed seal. The package will also include shipping and return information. Hover cursor over image to zoom in. Shipping: PRINTED TO ORDER. Please allow two weeks for printing and packaging of your piece. Some print runs may have stock pre-printed, in which case the piece will ship sooner. Shipments of giclees will be provided in thick rigid mailing tubes for protection during shipping. Framing: The framing stage is an important one! The frame you choose should reflect your taste and contain design elements (texture, color, decorating style) of the room in which it will be hung. Bryan recommends that you shop at your local framers for a style and price that you like, then take your artwork in for a consultation. Most framers have lots of experience and can help you pick out the perfect frame for your piece. Canvas giclees should be wrapped around stretcher bars or mounted to a solid surface. Some framers can also provide what's called a "gallery wrap" where the print is wrapped with the edges exposed. These should not be placed under glass. Certificate of Authenticity: The Certificate of Authenticity is a document provided with each painting, limited edition giclee, or print that certifies that it is an authentic reproduction by the artist. It also provides additional information about the painting or giclee/print, such as the specifics of the original (e.g., size, medium, and dimensions), as well as details about the reproduction, such as edition number, etc. Each Certificate is signed and embossed by the artist. Please retain your Certificate as an added store of value and as a collector's proof of purchase. More questions? Please see this helpful FAQ. A sweet robot out for a morning stroll. 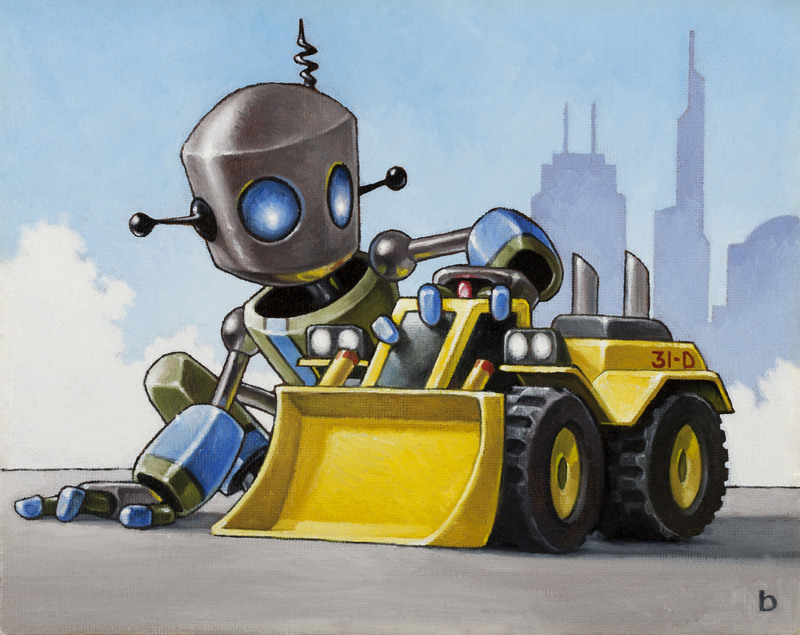 These “Automata” series giclees are available on fine art paper and in two sizes: 9 x 12 inches and 12 x 16 inches. Purchase three of the Automata series and receive a 10% discount! Getting creative with the crayons! 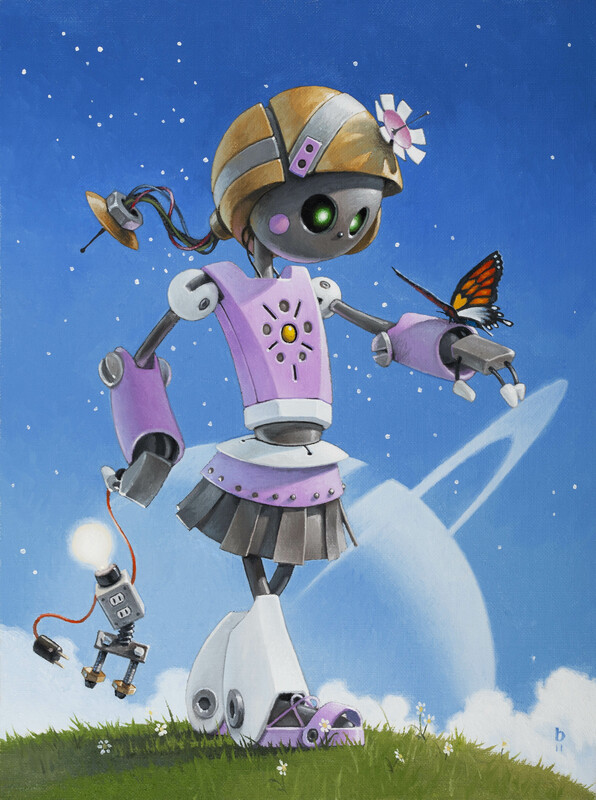 These "Automata" series giclees are available on fine art paper and in two sizes: 12 x 9 inches and 16 x 12 inches. Purchase three of the Automata series and receive a 10% discount! 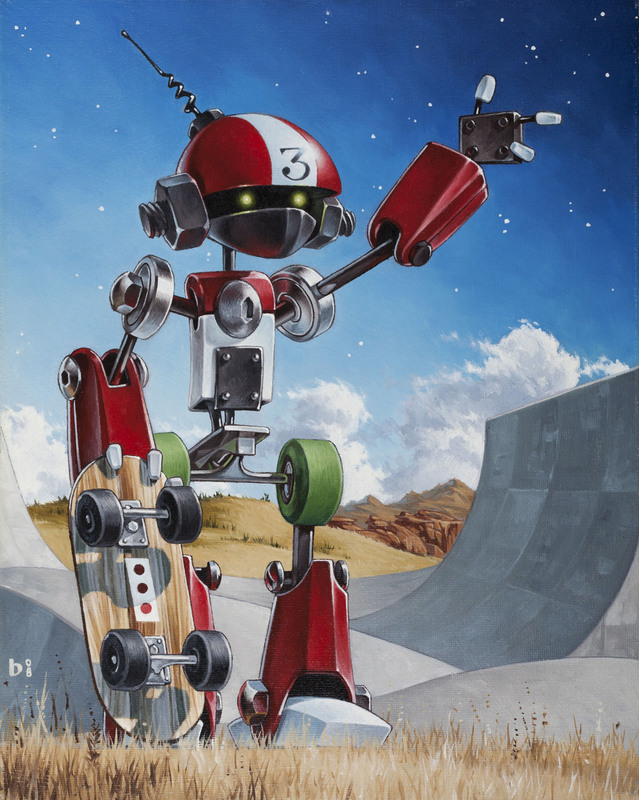 A special "Young Builder" with awesome inline skates. 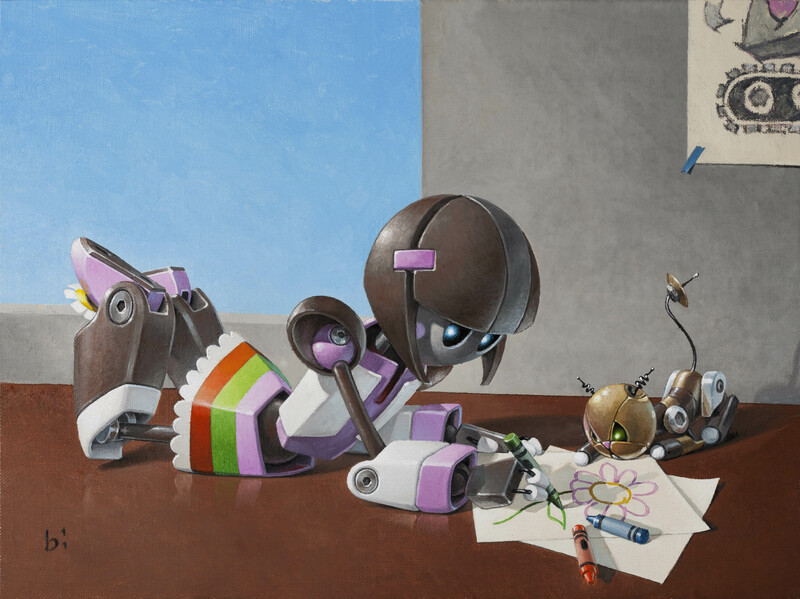 These “Automata” series giclees are available on fine art paper and in two sizes: 9 x 12 inches and 12 x 16 inches. Purchase three of the Automata series and receive a 10% discount! Yo dude! Let's shred it up on the half-pipe. 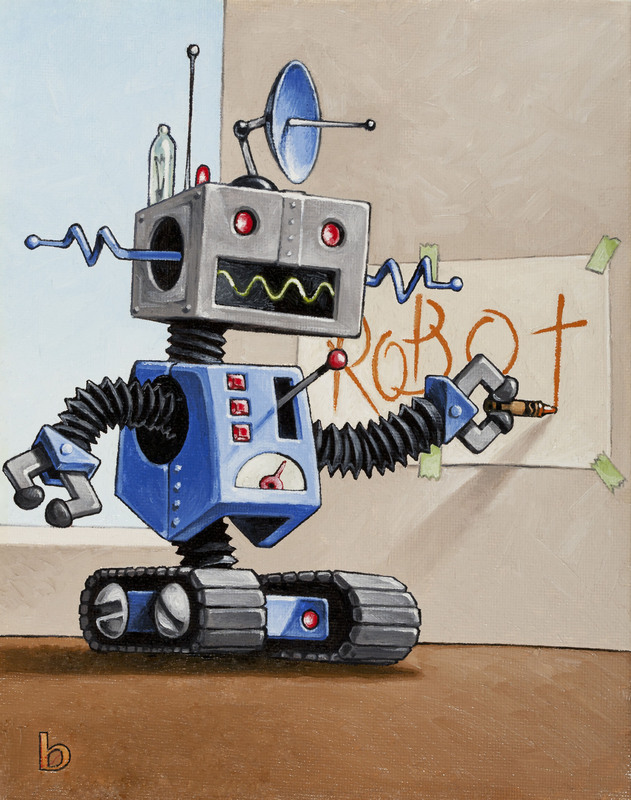 These “Automata” series giclees are available on fine art paper and in two sizes: 9 x 12 inches and 12 x 16 inches. Purchase three of the Automata series and receive a 10% discount! A cute little guy practicing his signature moves. These “Automata” series giclees are available on fine art paper and in two sizes: 9 x 12 inches and 12 x 16 inches. Purchase three of the Automata series and receive a 10% discount! Dump truck!! 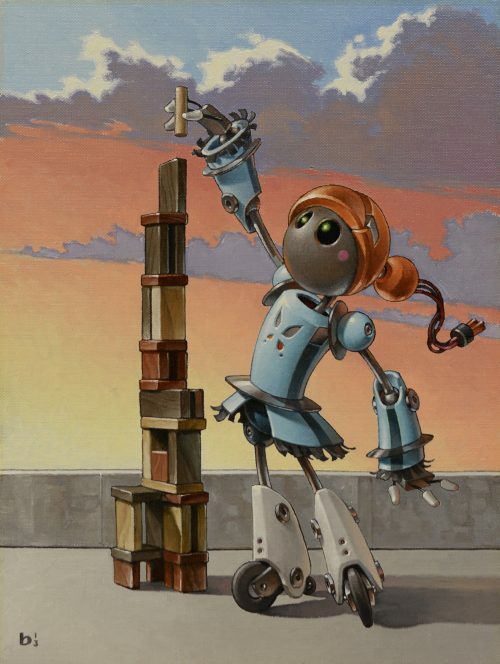 These “Automata” series giclees are available on fine art paper and in two sizes: 12 x 9 inches and 16 x 12 inches. Purchase three of the Automata series and receive a 10% discount!